How to Clean Your Car’s Floor Mats | Gold Eagle Co. If you spend a lot of time in your car like so many people do, you’re bound to end up with some crumbs and stains on your floor mats. And since the average quick car wash isn’t comprehensive enough to get rid of the debris on the floor, you’ll have to spend some time doing it yourself. Don’t worry; this is definitely a DIY project anyone can do! All it takes is some elbow grease and a quality cleaning product or two. Here’s how to wash your car’s floor mats so you can enjoy the look and feel of a spotless car for a while. Your first step should be to get rid of debris before you start working on scrubbing any stains away. So pick up any items that are on top of the floor mats, and then get ready to vacuum up crumbs or small bits of trash. You can start this process inside the car if you’d like to also vacuum the carpeted floor of your vehicle at the same time. But if you’re having trouble reaching the entire surface of each mat, you should pull them out of the car for easier access. If you do take them out, go ahead and shake them before you vacuum, since this way you can get rid of a lot of dirt and crumbs within seconds. Then use a handheld vacuum or wet/dry vacuum to make any remaining debris disappear. The best cleaning method for your car’s floor mats depends on what material they’re made of. Most mats are either made of rubber or cloth, so consider some cleaning tips for each material. If your mats are made of rubber, you can clean them in minutes with 303 Tire and Rubber Cleaner. If you have a little more time and not too many stains to get rid of, another option is to spray them off with a hose in your yard. Wiping them down with a wet, soapy sponge will remove any stubborn stains. Then you can rinse the mats with the hose. Either dry them off with a towel or hang them up to dry before you put them back in your car. 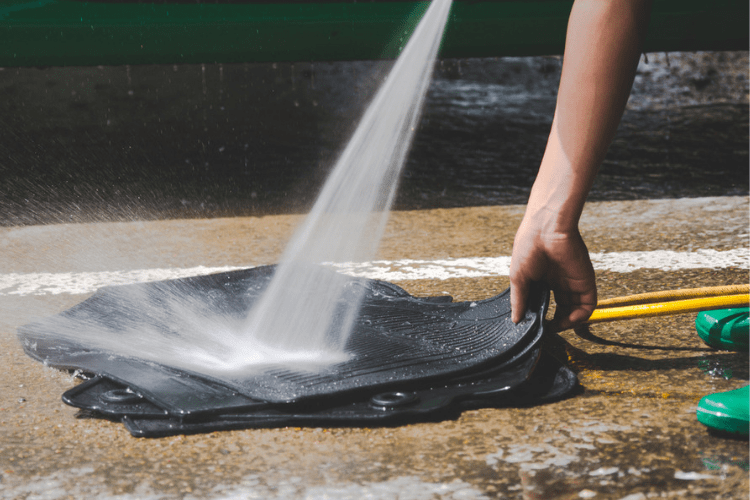 If your floor mats are made of cloth, the hose might be not your best option, since the mats will take too long to dry if you soak them with water. So instead, you can spot clean your mats by spraying 303 Spot Cleaner on any stains you see. This cleaning solution can remove all kinds of stains within minutes, from coffee and soda to grease and oil. Once you get rid of the stains, you can prevent more from occurring by spraying the floor mats with 303 Stain Guard for Auto Interiors. 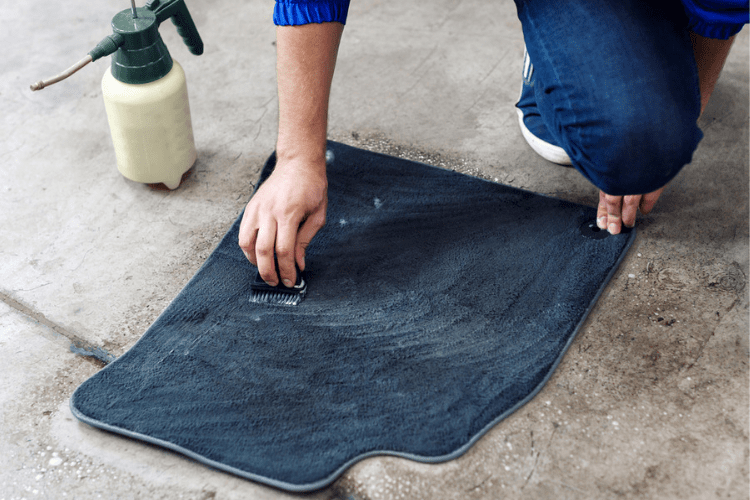 This way, the next time your coffee splashes on the floor mats or a fallen French fry threatens to leave a grease spot behind, the surface of your mats will repel those potential stains—leaving less work for you if you want a clean car. Now that you know how to wash your car’s floor mats, make sure the exterior is just as spotless as the interior. You can start by picking up the TriNova Car Wash Bundle so you have all the supplies you need for a thorough wash. Then work on your technique by reading DIY Auto Detailing: How To Properly Hand Wash & Polish Your Car.